Communication Styles directly impact team and interpersonal interactions. We will explore three predominate styles and behavior associated with each style. In addition, we will discuss strategies for interacting with persons exhibiting these styles. The three styles along with a brief discription are shown below. The person with this style tends to avoid conflict and becomes a "pushover" when they encounter a difficult or highly aggressive person. This person may even feel intimated by a person who expresses their ideas and needs. Being passive may not mean the person does not have strong opinions; often they do. They just don't voice those opinions due to fear or what they may consider "out of respect" for the other person. If this is your preferred style, I encourage you to speak up - especially when you feel strongly about a certain subject or topic. 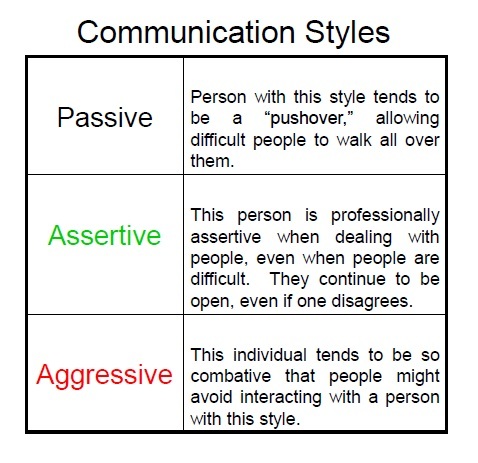 The person who is assertive will share their opinion and needs, and is usually interested in hearing the opinion and needs of the other person with whom they are interacting. Often, they are direct but not "brutally honest." There is an interest in dealing with another person with respect and integrity, honestly expressing their opinions and feelings about a given topic. Even when dealing with a person described as "difficult," they continue to be assertive and professional. Your good example plus inviting others to express themselves will result in more honest conversations and better outcomes. The aggressive person tends to "walk all over other people" and does not seem to care about the other person. They are concerned about their own interests and do not mind ensuring they get what they want, often at the expense of the other person. Needless to say, the person with this style can wreck havoc on team dynamics and may be the cause of unhealthy conflict within a group or organization. This person may be seen as a bully and overbearing since they will may sure their viewpoint is expressed. If this describes you, it will prove problematic in the long run. Learning to listen will help. As a leader, it is very important to understand communication styles, both yours and others. In order to work well with others, seeking to understand others is key to achieving maximum results.